I always love writing about celebrities finding romance among their fellow celebrities. 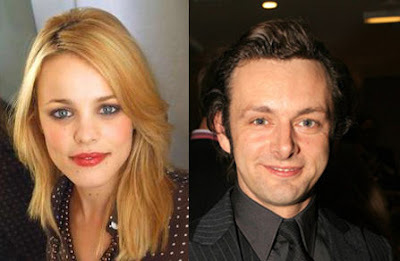 Rachel McAdams was seen in Toronto holding hands with Michael Sheen, her co-star in her new film Midnight in Paris. Now I am not sure if they are truly in love or just hooking up for publicity of their upcoming movie. The couple have not commented on anything yet since the photo was published at People magazine but I've read that they were again seen together at the Toronto Film Festival after-party. Well we can say they are enjoying each other's company since they are working together. Or we can say they are doing it for publicity. Then after the movie is released on 2011, let's see if we can say that they are truly in love. In case you don't know who Michael Sheen is, he starred in the Twilight Saga Movie: New Moon. Check him out at this New Moon movie trailer.